Ministry leaders from Grace Brethren congregations in Ohio, Pennsylvania, Indiana, and Illinois gathered this week at Mohican State Park Lodge near Loudonville, Ohio, for two days of spiritual revelation, building relationships, and relaxation during the Central Focus Retreat. The event began on Monday, October 10, and concluded this morning (Wednesday, October 12). Dan Allan, pastor of the Grace Brethren Church in Ashland, Ohio, led the majority of the sessions. He focused on “Finding Your Way Forward,” providing thoughts for the participate to navigate the ministry jungle. He emphasized Ephesians 2:10, stressing that to find the way forward, one must begin by finding their way back to identity in Christ. “We are God’s workmanship,” he said. On Tuesday morning, Bob Fetterhoff, pastor of the Grace Brethren Church in Wooster, Ohio, and the current moderator of the Fellowship of Grace Brethren Churches, encouraged the leaders to find their ministry sweet spot. Swinging a baseball bat for emphasis, he said, “When we are in the sweet spot that God has created, the ball just goes a little further.” He drew lessons from the life of Moses, noting that ministry leaders should know who they are, that their identity is in Christ, and keep an emotional balance. The retreat concluded on Wednesday morning with a discussion of the importance of traveling companions — who is on the journey through the ministry jungle with you? See photos of the East retreat on the FGBC World page on Facebook. 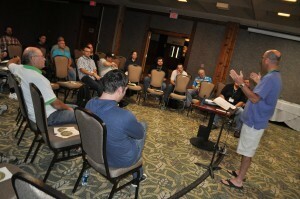 The next Focus Retreat, for ministry leaders in the east, will be held October 24-26 at Ocean City, Md.